Magnus Carlsen is 2015 World Rapid Champion! Magnus Carlsen is the 2015 World Rapid Champion! Congratulations! At the championship in Berlin he defended successfully the title that he won last year in Dubai. Carlsen started the first day with 4,0/5, remaining half a point behind the leader Karjakin. During the second day of the event Carlsen continued with yet another 4,0/5 to share the lead with Zhigalko. In the third and final day of the championship, the Norwegian grandmaster defeated his direct opponents, took sole lead and never let go until the end of the event. A round before the end, Carlsen was already unreachable for his opponents and secured his 2015 World Rapid title. On the shared second place are Ian Nepomniachtchi, Teimour Radjabov and Leinier Dominguez with 10,5 points each. After breaking the tie Nepomniachtchi is awarded with the silver medal, while Radjabov claimed the bronze. Full standings below. 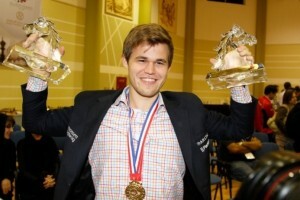 Carlsen also thanked the organizers and the spectators for filling up the playing venue to the capacity. Tomorrow starts the 2015 FIDE World Blitz Championship, where Carlsen has yet another title to defend. If he succeeds, he will not only be the first person to hold the three FIDE titles – classical, rapid, and blitz – at the same time, but he will also be the first one to re-validate them.